The Bellevue Collection, located in Bellevue Washington, just across Lake Washington from Seattle, is a shopping and dining destination not to be missed. Enjoy the shopping, restaurants and nightlife at Bellevue Square, Lincoln Square and Bellevue Place. Just a short drive from Seattle. With the multiple varieties of waste offered by the Bellevue Collection, the Sani-Tech Systems Auger Compactors were chosen to replace the less efficient hydraulic compactors that they already had on site. With the Sani-Tech Systems all-electric design, higher compaction ratios and the drastically reduced maintenance requirements compared to hydraulic compactors, the Bellevue Collection was able to drastically reduce the operations cost when switching to the Sani-Tech Systems Commercial Trash Compactors. Anywhere from restaurant waste produced from the dining experience, to the cardboard and general trash produced from the retail stores and other tenant space, the Sani-Tech Systems Auger Compactors easily and efficiently handle the waste that is generated from a large property such as the Bellevue Collection. With multiple Sani-Tech Auger Compactors located at the Bellevue Collection, pictured below are Models ST1046/36 installed onto an existing platform, fed by an existing trash chute. 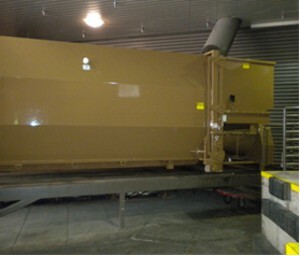 This particular Commercial Trash Compactor is used by several tenants of the property and is processing co-mingled trash. Sani-Tech Systems specializes in custom design and fabrication, based on the needs of our customers. We are easily able to design a solution to fit your needs, and adapt it to any existing components that you may already have on site. 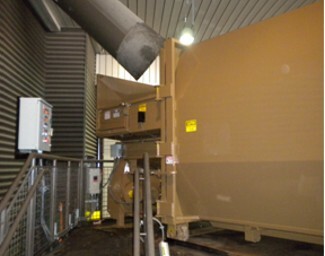 Two of Five Sani-Tech Systems Auger Compactors installed since 2012 at The Bellevue Collection by Sani-Tech Systems. If you have questions or need assistance getting a hospital compactor for your facility do not hesitate to contact Sani-Tech today at 1-800-467-7336 or by filling out the form on our contact us page.